Since the Global Financial Crisis, Central Banks have taken a back seat allowing their stimulus packages to talk for them. Buying assets, debasing the currency and generally doing very un-central bank things led us to believe that the market had won. But, now they’re back. And I for one am pleased to see them. 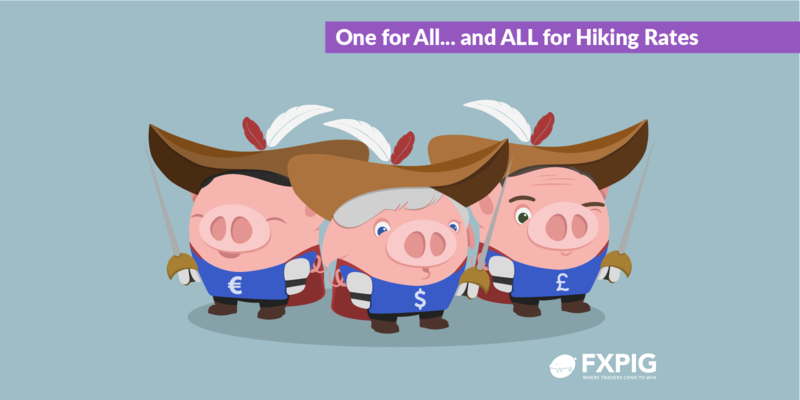 The three musketeers, Janet Yellen, Mark Carney and Mario “D'Artagnan” Draghi. Doing what they do best. Yellen got things rolling, hiking rates for no good reason just because she could. It was probably because Trump asked her not to. It’ll cost her job come January but it was worth it. Carney has been giving us reasons all year why inflation was going to fall on its own but now his Chief Economist has told him it won’t so he has decided, “all on his own” a hike is needed. Mario Draghi, the ECB President, is now the darling of the Eurozone. Even the Greeks love him! He is a hawk in dove’s clothing one minute, then a dove in hawk’s clothing the next! If he had run away to the circus as a child he would have been the tightrope walker. Forget Brexit, General Elections and non-farm payroll. Central Bankers are back! You will recall my epiphany? I suddenly saw the “technical analysis” light! Well that has continued this week, as I have learned about Candles, Bars, Lines and Renko! Candles are not just what you use to create a romantic atmosphere, bars are more than where you find me on a Friday night. Lines? We’ll gloss over that. But Renko? That was a new one on me and deserved a little attention. Renko charts ignore time and focus solely on price changes that meet a minimum requirement. Never say you don’t learn something reading Mr. Markets! Despite my newfound education I am still drawn to the fundamental stuff. At least now I understand where my stop loss should be, even using an average true range! But it is the fundamentals that made me open the position in the first place. This week we will have the once monthly fundamental extravaganza that is the U.S. employment report. A chance to lose your entire account on the “turn of a single card”! Seriously though a balanced attitude to trading like life will serve you best. Technicians and fundamentalists are like May and Corbyn entrenched in their view. But there is another path. I am not sure yet whether I will call it “technamentalist” or “Fundician”, but once I decide, you will be the first to know. So, that was the first half of 2017? As half years go, it was pretty exciting. Trump debased the Presidency as half of us knew he would and the other half feared he would. Rate hikes made a return. Politics brought another surprise result and two relief ones. The Eurozone finally matured turning from spotty youth to a young person with the world at its feet. The single currency has been the star of the show, rising by over 10% against the dollar despite a widening of the interest rate differential in favor of the greenback. Honorable mentions go to Mark Rutte and Emmanuel Macron for defeating those nasty nationalist right wingers. Theresa May gets the “David Cameron Award” for misjudging public opinion. “Brexit? They’ll never go for it”. That single sentence cost Cameron his career. A hung Parliament in the U.K.! No one saw that coming. Politics, like Central Banks, is coming back to muddy the trading waters even more!